Gamagori city in Aichi prefecture faces Mikawa Bay and is situated between Atsumi and Chita peninsulas. It is blessed with mild weather and the delicacies of both mountain and ocean. The founder, Chozaburo Takemoto established TAKEMOTO OIL & FAT (TAKEMOTO OIL at establishment) in Goyu town in Higashi-Mikawa in 1725 (the 10th year of the Kyoho period). It is the oldest operating oil extraction company in Japan. In the Edo era at the time of establishment, oil wasn’t used for cooking but for lanterns. TAKEMOTO OIL & FAT used to extract oil mainly from cottonseed. The company first began to extract oil from sesame in the early Taisho era. Why extracting oil for a living? Because cotton cultivation in the Mikawa region had flourished since the Azuchi-Momoyama era and Mikawa cotton was a prosperous industry. Cottonseed oil is a by-product of cotton production. The fluffy fiber was separated from the raw cotton seeds in the center and the fiber used for cloth. The cotton seeds were ground by water mill to extract the oil and the cottonseed meal that remained was shipped for livestock feed or fertilizer. Times changed. In the 29th year of the Meiji era, the import tariff on raw cotton was abolished, putting a cloud over the cotton industry, but the spread of electricity made lighting oil redundant. When World War I started and it became possible to cheaply import sesame from China which had previously been exported to Europe, TAKEMOTO OIL & FAT switched to extracting oil from sesame instead of cottonseed and moved the factory to Gamagori, the next town. At present, the factory of TAKEMOTO OIL & FAT is alongside the Gamagori seashore. 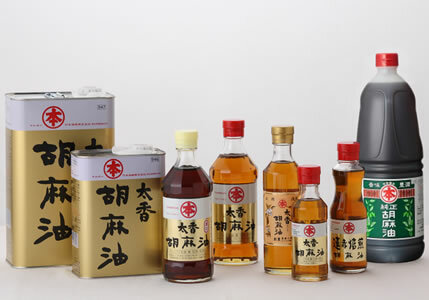 Daily production of TAIHAKU sesame oil, TAIKOU sesame oil and commercial oil totals approximately 70 tons. The factory operates continuously from Monday morning until Sunday morning. The fragrance tickling your nose when you alight at the station will become more aromatic the closer you draw to the factory. 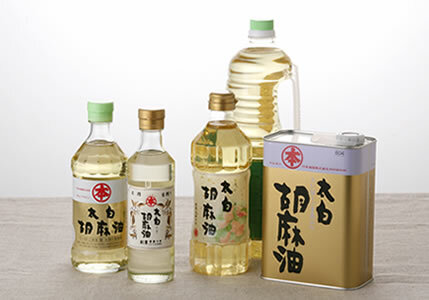 A pure sesame oil pressure-extracted from select raw materials without roasting. TAIHAKU sesame oil differs from normal roasted sesame oil by being almost clear and not having the typical sesame oil aroma. The “umami” (savoriness) of sesame is condensed to a deep flavor which draws out the natural flavors of other ingredients. Having no color or fragrance allows it to be conveniently used in a wide range of cuisines such as Japanese, Western food, Chinese, for confectionery and baking bread, etc. A pure sesame oil pressure-extracted from select sesame which has been slowly and carefully roasted at low temperature. TAIKOU sesame oil features an elegantly mild aroma and flavor. Since the aroma isn’t overpowering it can be used not only for adding aroma to Chinese and Korean food but also in a wide range of Japanese and Western food as well. No chemicals or additives are used in Maruhon pure sesame paste. Please enjoy the natural nutrition of sesame. You can savor the unique well-rounded fragrance of sesame roasted and ground to perfection. 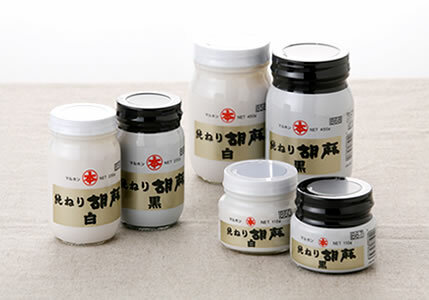 This is Maruhon’s proud product – the same as our sesame oil. Not only can it be used in sesame dressing but it can also be blended in variety of sauces or used in making sweets. The oil will separate – this is proof that it is additive-free! Before using, please mix well until it’s in a dripping consistency. The phrase “a little goes a long way” describes sesame oil perfectly. Too much in a dish, and you notice it. Not enough, and you notice that, too. Just the right amount, a small amount, adds a heavenly, nutty, musky undertone to Asian stir-fry and sauces, and it’s a key ingredient in my favorite all-purpose works-with-any-leftovers seasoning: three parts low-sodium soy sauce; two parts oyster sauce; and one part sesame oil. Buy sesame oil at an Asian market (I’m partial to the Maruhon brand, recognizable by the red cap), and store it in your cupboard. My original ingredient post about sesame oil will tell you more.